Normally, you would expect the announcement that inflation has fallen as far down as 1% to be greeted with joy. Yet, the Consumer Prices Index’s fall has led economists to start to worry about a different problem: Deflation. Certainly, the press and the Government have been positive about it. That prices are rising slower than wages are rising can only help with the costs of living. This is particularly resonant given that the fall in inflation is because of the drop in fuel prices (caused by the fall in the price of oil) and the fall in food prices (caused by the current supermarket price wars). That the fall in inflation was caused by price falls in goods that were so central to the average household’s budget will feel like a tax cut to the public. It means that should Bank of England Governor Mark Carney have to write the letter to Chancellor George Osborne that he will need to write should inflation fall again below 1% (the Bank of England has a target of 2% plus or minus 1%), the letter will not be difficult to write. Any government that has achieved inflation- less economic growth is a government that should be happy with its’ lot. It has even been called an “early Christmas present”. This is why we have to leave the voices of dissent to economists. The Eurozone is currently battling deflationary pressure, and it is feared this could now happen in the UK. It is easy for people to think deflation might be a good thing. After all, if prices fall, surely that is to the advantage of the British public right? Wrong. Deflation can be a disaster for an economy. Deflation works for an economy if prices fall as peoples’ disposable income is rising. But in almost all cases it will be falling. Here’s why. Deflation discourages consumer spending – think about what you would do if you knew prices were falling. You would delay expenditure wouldn’t you? This is why deflation leads to lower consumer spending and lower economic growth, which could mean unemployment and lower wages. The Japanese ‘deflationary spiral’ that lasted for 20 years started here. Deflation increases the real interest rate – If you have money in the bank and deflation is 2%, then even if Interest rates are at 0%, you are getting a 2% return on your bank account. So there is an inadvertent tightening of monetary policy. Britain can use quantitative easing to help here, but Eurozone countries can’t. But given more money might be saved, it will reduce consumer spending and again add to the slowing of economic growth. Deflation increases the real value of debt – If you have debt of £10,000, that amount becomes smaller with inflation, but bigger with deflation. So debtors have more problems paying off their debt. This adds to the fall in consumer spending mentioned above as consumers have less disposable income. Deflation causes real wage unemployment – Prices are falling for companies, but wages won’t fall. Workers simply won’t accept a fall in nominal wages (wages not taking into account of inflation), even if prices are falling. But that puts companies in a difficult position. Spending is slowing down, and the revenue they get from units sold is falling due to deflation. So companies have little option put to cut costs, raising unemployment. This lowers disposable income, and thus consumption and economic growth. Worse, as Japan has experienced, once deflation sets in it is difficult to get out of. The fall in demand caused by the consequences above leads to unemployment which leads to a further fall in demand. 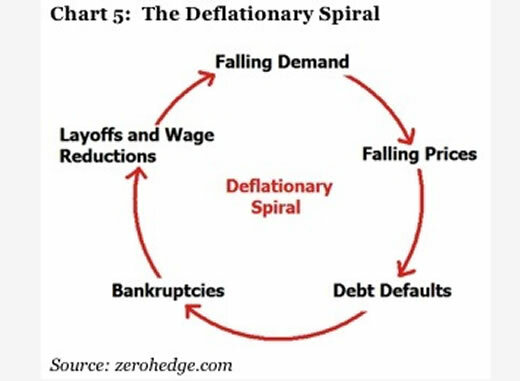 This is why you can get into a ‘deflationary spiral’, and why the Government and the Bank of England need to be careful about this fall in inflation. So what should they do? Well, we should see what happens in the near future. The fall in fuel prices is caused by the fall in oil prices, and that could be temporary. If oil prices rise again, so could fuel prices, and inflation could get higher. Supermarket price wars ‘break out’ but don’t often last. So the Government should wait and see if this fall in inflation sets in longer term. If it does? The Government get the luxury of needing to use policies that might stimulate demand, although it is not that simple. They could use quantitative easing to print money, but what is more likely politically might be some tax cuts. However, there is one problem with tax cuts – the deficit. As Shinzo Abe is discovering in Japan at the moment, trying to combat deflation when you have a debt problem involves macroeconomic conflicts that are extremely difficult to resolve. More on that in a future blog. So yes, we should be happy with inflation at 1%. But not too happy. I very much enjoy your golden blogs, and I’d just like to weigh in on the deflation issue. Is it possible that our efforts to avoid deflation have caused more problems than giving in to it? Central banks keeping interest rates artificially low was arguably one of the main causes of the 2008 crash, encouraging an unsustainable debt bubble. One could even argue they have made the same mistake again in recent years with QE, inflating bubbles in stock markets (particularly emerging markets), property markets, commodities such as oil (now bursting), and – worst of all – bonds. Junk bonds are dangerously overpriced and possibly also starting to burst. Some government bonds are also at crazy levels, for example in Italy the government can borrow more cheaply than at any time in recorded history, even though the economy is in pretty poor shape. Such bubbles are disasters-in-waiting. So what could we have done instead? Perhaps the sensible reaction to the industrialisation of the East and the flood of cheap goods to the West in recent decades would have been to accept the mild deflation which is surely the natural result of cheap goods. To address the points you made: deflation does not necessarily discourage consumer spending. China has been churning out cheaper and cheaper electronics for years, yet it doesn’t put off consumers, even though they know their new tv will probably be even cheaper in a month’s time. I’d argue Japan is a special case, suffering from uniquely deflationary demographics and extremely conservative business structures. Yes, it’s hard to keep monetary policy loose with deflation, but as I’ve argued, it’s perhaps too loose anyway. And yes, debt becomes more difficult to service. But real incomes will rise with deflation, which will help to counteract any further deflationary impact of these factors. Would unemployment rise? Surely that depends on how general the deflation is. Just because certain products get cheaper (e.g. Chinese consumer goods, petrol, some foodstuffs), it doesn’t necessarily mean everything must get cheaper, or indeed that profit margins of British companies are seriously threatened (after all, they’d be buying from their suppliers more cheaply). In fact, several European countries are currently experiencing falling prices and rising GDP simultaneously. These are just some of the factors that work to prevent a ‘deflationary spiral’. Thanks for your kind words, which from you mean a lot. 1) You spend a bit of time talking about the consequences of the anti-deflationary policies since 2008. Those policies do have a downside, we know that, but governments and the economists who advise them may well argue that those downsides were not as great as the benefits of avoiding deflation. I am not a believer of not going ahead with a policy because it has a downside…there are always downsides to policies but there are also benefits. Central to this is assessing whether avoiding deflation is vital. 5) The point you make about real incomes rising with inflation may be true, but, should companies start to lay off workers as their revenue decreases, the incomes will not rise a lot, and in some cases there may be a fall in consumption as workers wait to see if the threat of unemployment applies to them. 6) Which is where I have to say that your point about companies still making profits if prices fall as their costs may be falling…only if labour isn’t a high proportion of their costs. So it depends on how labour intensive or how costly labour is for them, because key to this is that workers are unlikely to accept a nominal wage fall even if prices are falling. Yes I agree Paul, it depends, it depends, it depends. And that is why I tend to be sceptical when governments & central bankers find new toys to play with. Some economist tells them “if you push this lever, then this will happen”, but the consequences ripple out in all kinds of unexpected ways. For example, we still haven’t seen much of the fallout from QE yet. We’ve seen how it pushed the dollar down and caused various speculative bubbles, but now that the US has ended QE, the dollar has begun to rise strongly. With Japan and possibly Europe easing as well, there will be little to stop the dollar’s rise, which could mean a huge global monetary squeeze. (In fact global money supply has been falling for several months already). Anyhoo, on a slight tangent, you might like to take a look at this recent Dani Rodrik article about inequality / efficiency. His conclusion? It depends of course. A level students often find that the most annoying thing about A level economics is that there is no right answer. We try and teach that it is not important what your answer is to these conundrums, but that you develop the skills of analysis and evaluation to be able to come up with a fully justified conclusion yourself about what you think. It’s my favourite thing about the subject, but some pupils in particular find it annoying. If there were right answers, Economics just wouldn’t be the subject that it is.